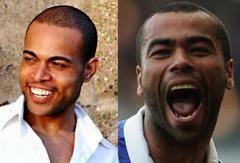 Meet professional Ashley Cole lookalike Leon Knight. Last time we checked Leon Knight was a Wycombe Wanderers striker who began his career with Chelsea. But this Leon Knight’s only connection with the Blues is the fact that he is paid to impersonate Ashley Cole. Leon is available to hire through the Fake Faces website. Everyone has to earn a living, but that doesn’t make it any clearer why people think paying a random man of mixed race origin to appear at their event gives it any prestige!